The All Saints Educational Trust exists to help make a lasting improvement to the welfare and future prospects of individuals and communities, both at home and overseas, through the promotion of better teaching, particularly of Religious Education and Home Economics, inspired by a practical tradition of Christian belief and Church of England-sponsored teacher training. 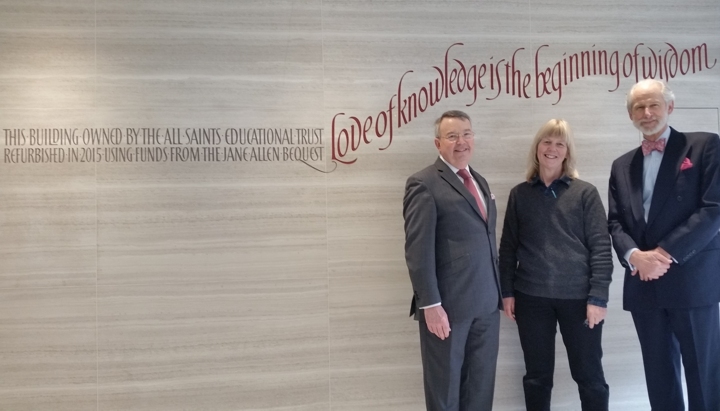 In fulfilling this vision, the Trust will give practical support to individuals and organisations in the encouragement of teacher education and in the pursuit of innovative professional development - particularly in the disciplines of Religious Education, Home Economics, food and nutrition education, and public health promotion - from the standpoint of Christian insights and life values. Stephen Brooker (Trustee), Lida Kindersley (Engraver) and David Trillo (Trustee). 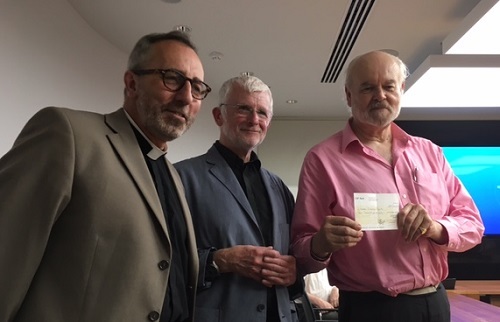 Today we presented The Rt Revd and Rt Hon Richard Chartres with a cheque for his Lenten Appeal 'Sowing Seeds for Tomorrow in Angola & Mozambique' (which supports education in those countries) to mark his retirement and to thank him for all the work he did for the Trust over many years. The All Saints Educational Trust is a charitable Trust that makes awards annually to students and organisations. We are a member of the Association of Church College Trusts. support specifically the teaching of Religious Studies and Home Economics and related areas - such as the promotion of public health and nutrition, both at home and overseas. The Trust offers both PERSONAL and CORPORATE awards. Are you eligible to apply for an award? Professor A R Leeds, MB BS, MSc, CBiol, FRSBiol. Our Annual Report and Accounts (2018) are available as a PDF document. Contact details can be found under 'Contact Us'.